When the Rheinmaidens playfully tease Siegfried at the start of Act II, their musical movements were far better than the unmusicality of the irritatingly intrusive dancers, who reappeared in this final part of The Ring. Their manipulation of silk sheets was fine, but this is the first time I have seen opera ladies move more gracefully than dancers, which suggests Belgian director Guy Cassiers should abandon them and let Wagner’s music speak for itself. Under Barenboim’s direction it did so in spades, with a grippingly emotional Siegfried funeral march movingly complemented by a red glow in the lighting. But after this the production failed to carry conviction. Siegfried’s arm merely flopped to one side rather than rise in warning to Hagen, who stayed where he was before quietly leaving the stage. He suddenly returned from stage-right to shout Zurück vom Ring, before barging his way through the onlookers to get to the Rhein, but why wasn’t he anxiously waiting and following Siegfried’s body with his eyes? It didn’t make sense. Nor did some of the video imagery of faces with tongues hanging out, but there was fine singing in abundance. Waltraud Meier, an exceptional Sieglinde in Walküre, returned to sing Second Norn with a lovely evenness of tone, and reappeared strongly as Waltraute in a well wrought conflict with Brünnhilde. Iréne Theorin was commanding in that role, singing with effortless intensity. 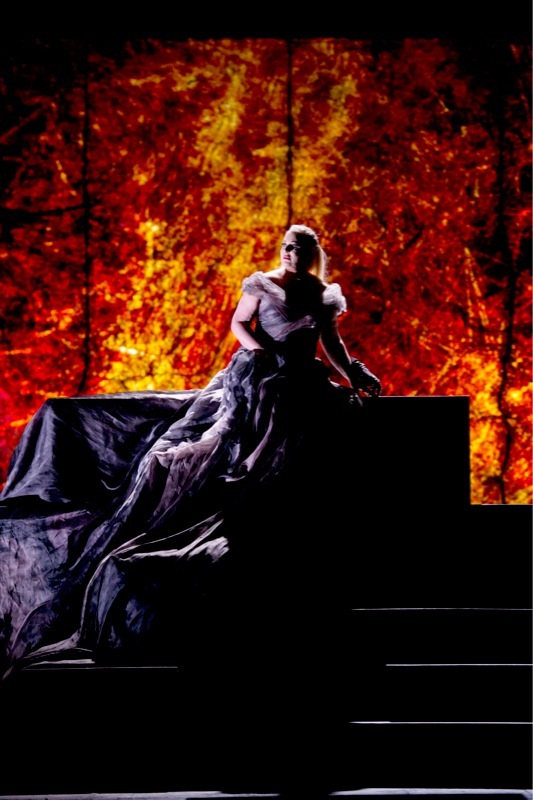 Siegfried was boldly sung by Andreas Schager, slim, youthful and convincing, as was Mikhail Petrenko as Hagen, and Johannes Martin Kränzle reprised his deeply powerful Alberich. Anna Samuil returned from her Freia in Rheingold to sing Gutrune, and Gerd Grochowski was an immensely effective Gunther, his firm voice complementing a melancholy stage presence that reminded me of a younger Jeremy Irons. His performance was an unexpected pleasure. Overall, this production has its strong points, particularly in the lighting and some of the better video imagery, but its weakest points lie in the use of dancers. Rheingold was particularly bad in this respect, and Walküre was easily the best part, and the only one in which dancers were entirely absent. An interview in the Walküre programme showed Belgian director Guy Cassiers to have some rather naïve political ideas that included blaming Europeans for much of the poverty in the world. Perhaps his attitudes stem from Belgium’s poor colonial record, but noting that Wotan is cleverer than many of today’s politicians is a bit jejeune. That Monsieur Cassiers is inspired by concepts relating to the interplay between good and evil, and success and failure, is no bad thing, but the unifying force that makes this Ring work so brilliantly is surely the musical direction by Daniel Barenboim. That plus a clever choice of singers who fitted their roles made this a hugely musical pleasure. This excellent production by Elijah Moshinsky uses a bare stage with gloriously elaborate movable designs and wonderful costumes by John Napier, subtly lit by Oliver Fenwick. It has deservedly been in the opera house repertoire since 1977 — longer than almost any other production — and the present revival was conducted with great clarity by Semyon Bychkov, amply showing the light and shade of Wagner’s music. As to the singers, Johan Botha’s Heldentenor voice gave us a superbly sung Lohengrin, and his stage presence showed gravitas but little charisma. Edith Haller was a beautifully voiced Elsa, though she struggled in the final act towards the end of a long evening — this was an uncut version of the opera. They were both very well complemented by the wonderful singing of Petra Lang as the evil Ortrud, Gerd Grochowski (replacing Falk Struckmann) as the fatally weak Telramund, and Kwangchul Youn as King Henry. 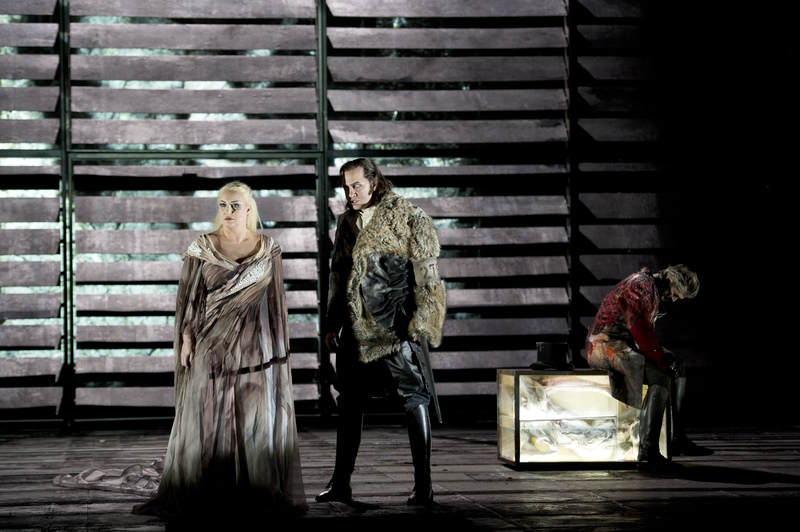 Both Petra Lang and Gerd Grochowski inhabited their roles in a particularly convincing way, not only while singing but also in their silences. Of Wagner’s ten operas in the standard repertoire I think of this as my least favourite, but the combination of an excellent production by Elijah Moshinsky, fine conducting from Semyon Bychkov, and terrific singing from the principals and the chorus made this the best Lohengrin I remember seeing.